Patience Lee Maldonado-Gilchrist, 12, also known as CoCo, successfully underwent a double lung transplant at Children's Hospital of Philadelphia on December 24, 2015. A young Trenton girl diagnosed with pulmonary fibrosis received a life-saving gift this Christmas after undergoing a double lung transplant at Children's Hospital of Philadelphia. 12-year-old Patience Lee Maldonado-Gilchrist lived up to her name after waiting several years at CHOP in search of a solution to her condition, which progressively restricts the ability to breathe as scarred lung tissue becomes stiff and damaged. Popularly known as Coco, Patience and her family announced on their GoFundMe page that the procedure was completed on Christmas Eve and her recovery is already going better than expected. Following her surgery, Coco was able to hold a conversation with her grandmother, Lucy Rivera, who has raised her since birth. 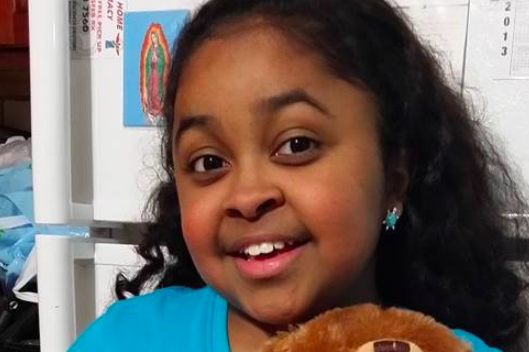 Since launching the GoFundMe page in April 2014, Coco's family has raised more than $18,000 toward building her a bigger room at home for her medical machines and equipment following surgery. Donations to the family can be made here.